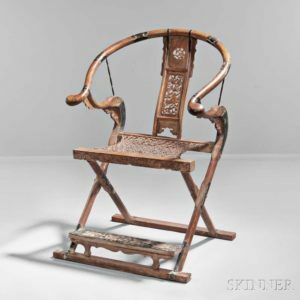 A Conversation About Collecting Asian Art with Richard Kenworthy, PhD | Skinner Inc. Primarily China and Japan. 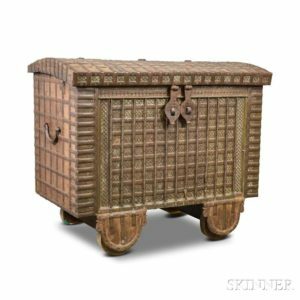 We do have a very unusual piece from India: a dark wooden valuables chest with decorative straps around it—in the right space, it would be very dramatic (Lot 1520). There is also a Tibetan thangka of very fine quality (Lot 1550) from the estate of Dorothy Braude Edinburg. Do you collect anything currently that is represented in the auction? If so, when did you start and what sort of pieces do you own? I collect Scholars’ rocks (which we actually do not have in the current sale). These, of course, are naturally occurring stone sculptures: ideally, they have been untouched by human hands, although this is in fact rare. Different types of stone are considered rarer or more beautiful, ling bi stone being the gold standard. I started collecting the stones in China in 1998 and brought back some in my suitcase, to the amazement of my Chinese colleagues. I also collect Japanese paintings from the nanga school: these were Japanese sinophile artists, mostly from the late 18th and early 19th centuries, of which we have a fine example in the Asian Art online auction. Lot 1623 is a painting from the collection of Robert Ellsworth by Nukina Kaioku (1778-1863) who was primarily known for his calligraphy. You can see his broad brush work on the mountain and his very characteristic nervous strokes, as well as a nice wash of color in the painting. Along with some Japanese paintings, the auction also offers a lot of Japanese prints. Could you define the terms I see used in the catalog descriptions—ukiyo-e, oban tate-e, oban yoko-e, and surimono? 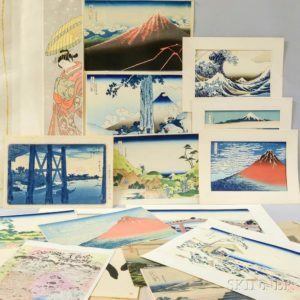 Terms related to Japanese prints (the genre Ukiyo-e refers to a style mostly represented here by woodblock prints) are very specific and categorized. Most of these terms are related to the dimension or the orientation of the work. As all the paper was handmade, there is a limit to the largest paper size, known as o-bosho. Oban (the most common size) is ½ of an o-bosho sheet and corresponds roughly to a folio size. Tate-e works have a portrait-style orientation and yoko-e a landscape orientation. Lastly, surimono were commissioned for festivals or other special occasions. I have a modern interior and would like to incorporate some Japanese prints. What would you suggest for a beginning collector? I would certainly give Lot 1705 a closer look. The lot contains principally reproductions, but not all are photomechanical and some are colored with vegetable dyes. Traditionally a printmaker would learn by copying the masters, who are very well represented here. Unlike certain fine prints that must be essentially kept in the dark—the color yellow is especially sensitive—these are nice decorative pieces that could easily be displayed and enjoyed. See Frank Lloyd Wright, the great master, who was a collector and dealer in prints to help supplement his income while in Tokyo working on the Imperial Hotel. For an excellent example of a modern interior featuring Japanese prints and ceramics, take a look at the Living Room from the Francis W. Little House at the Metropolitan Museum of Art, designed by Wright. What about an Asian piece of furniture? If you have a simple, classic house, an early Chinese piece would do very well, whereas later Chinese furniture, 19th-century for example, fits nicely in a Victorian setting. One highlight from this sale is a lovely folding horseshoe-back chair (Lot 1684) from the 19th-century. With the warmer weather approaching, any suggestions for the exterior of my house or the garden? There is a large pot from Thailand (Lot 1788) in the sale which would be great for lotuses or miniature water lilies—I actually grow these at home—and could be brought inside for the winter. Is there a piece in the auction that strikes you as particularly interesting? For a glimpse into an interesting historical period, Lot 1895 contains photos by Karl Boy-Ed, the German naval attaché to the United States who was in China during the Boxer Rebellion, as well as a folding map of the “legation district” in Beijing and a folding map of the same district during the Boxer Rebellion. How would I use a tea brick? 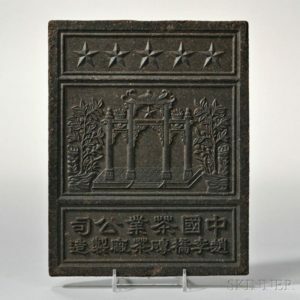 The use of Chinese tea bricks–brown tea compressed into bricks then shaped in decorative molds—dates back to the Ming dynasty. In some cases, the tea was mixed with manure as a binding agent. A piece is broken off, toasted to remove fungus and microbes, then ground into powder and whisked into nearly boiling water. We have several examples in the sale (Lots 1801 and 1802). I imagine you could drink it, but I think I’ll stick to Earl Grey, thank you. View all lots offered in the Asian Art online auction. This entry was posted in Blog and tagged antiquities, Asian Art, China, Chinese art, collecting, collection, fine art, Indian, Japan, Japanese art, Japanese prints, online auction, Richard Kenworthy, skinner auctions, Tibet by Skinner. Bookmark the permalink.